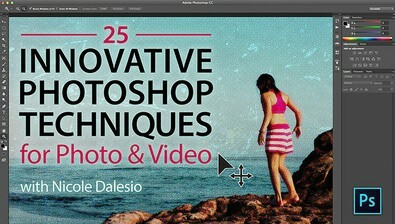 Unlock impressive editing and artistic tools as Adobe Education Leader Nicole Dalesio guides you through 25 techniques to create striking photos and videos. Discover innovative effects such as how to use filters and color enhancements to turn your images into toylike miniature worlds. Master the powerful Content-Aware tools for effortless editing and find out how to seamlessly retouch and relocate objects with incredible precision and control. Create digital art as you learn to add texture, surreal effects and hand-drawn details to your work. Explore a range of video editing tools and learn to apply artistic effects to video clips, "stamp" individual frames with texture and even turn an image sequence into an animated GIF. Find out how to make the most out of Photoshop and unleash a new world of creative possibilities!